The debut of the Colorado Classic earlier this month set a new bar for road racing. As a replacement for the USA Pro Challenge, which dissolved in 2015, it offers a new chance for some exciting racing in Colorado once again. Racing in Colorado has always been a special experience for me. The fans, race atmosphere, and high mountain passes create a very unique bike race. After moving to Fort Collins this past January, I was even more excited to see a return of a UCI 2.HC race to my home state. This year’s Colorado Classic provided a new format of professional cycling, one that could be profitable for a promoter by combining shorter, more exciting stages with the Velorama music festival. I think riders and fans alike were excited and also a little bit unsure as to what to expect, which is a nice change from the predictability that often surrounds top-level professional cycling. The Colorado Classic started right on the heels of the 2017 Tour of Utah. Only three days separated these races, making recovery even more crucial than during previous years. Utah was my main objective for the second half of this year, so after seven days of racing and defending second place on GC, I was both mentally and physically exhausted. However, I was still fit and motivated to race in Colorado. The three days in between these two events is mostly a blur. I feel like I took a few naps and woke up at team presentation the day before the start. Mentally checking out while also taking care of your body is crucial during the time between stage races. We made a few field trips to Whole Foods in an attempt to balance out our diet of rice and sugar, got daily massages, and spent the remainder of our free time lying in bed. Keeping your emotions in check is always one of the most difficult aspects of competing and getting the results you’re capable of. After a successful week in Utah, more people start to think of you as a GC contender, and the pressure to perform can start to build. As such, I was chosen to be the UnitedHealthcare Pro Cycling team’s representative for the pre-race press conference. Sitting alongside Cannondale Drapac’s Rigoberto Urán (fresh off a podium at the Tour de France), Taylor Phinney, Peter Stetina, Brent Bookwalter, and Danny Pate answering questions from Christian Vande Velde and Bob Roll was an awesome experience and definitely made me more excited to get the racing underway. Personally, I think coming off a good race at Utah took some of the pressure off me and I was mostly just excited to race in my newly adopted home state alongside some of the best riders in the world. Once the gun went off in Colorado Springs and racing was underway, it was bike racing as usual. Racing at high altitude is very different to sea level, and is something that requires meticulous planning and preparation. Due to geographic limitations, this is something that European teams can’t do quite as easily as U.S.-based squads. With that in mind I knew that despite a handful of guys coming in fresh off the Tour de France, UnitedHealthcare would have one of the strongest teams and would need to take responsibility. Our primary focus was on stage wins and the points jersey for Travis McCabe. Our secondary goal was for a high GC placing for myself and Jonny Clarke—if we had the legs. On stages 1 and 2 (the stages most likely to be “sprint” stages) we were the first team to take control to ensure the breakaway didn’t get out of hand. Our faith in Travis paid off with two podium finishes and the points jersey. Unfortunately, neither Jonny nor myself had the legs to stay with the leaders in Breckenridge, which was the major GC day. Overall, we had a very successful race and I was happy to ride in support of Travis after all the hard work my teammates put in for me at Utah and other races all season long. Colorado is a beautiful place to ride and race a bike and I’m happy that the organizers of this year’s Colorado Classic and Velorama are trying to promote that. Colorado is filled with people who love the outdoors and deserve a cool event like this that they can support. The Breckenridge stage was lined with people all around the course, so much so that there was only room to ride single-file on the steep sections of climb. It was hard to not crack a smile when you saw people out there partying and having a good time, even as my heart rate approached 200 bpm at 10,000 feet. I’m sure the logistics of combining a music festival and professional cycling event are daunting, especially in a major city like Denver, but I really hope this event can pave the way for future events like it. Cycling isn’t always known as a “cool” sport to do, and the more new fans we can attract the better. Thanks to the organizers of this years race for trying to keep pro cycling alive in Colorado! Photos courtesy of UnitedHealthcare Pro Cycling Team. Gavin Mannion is a professional cyclist for the UnitedHealthcare Pro Cycling team. Gavin has been racing professionally since 2010. 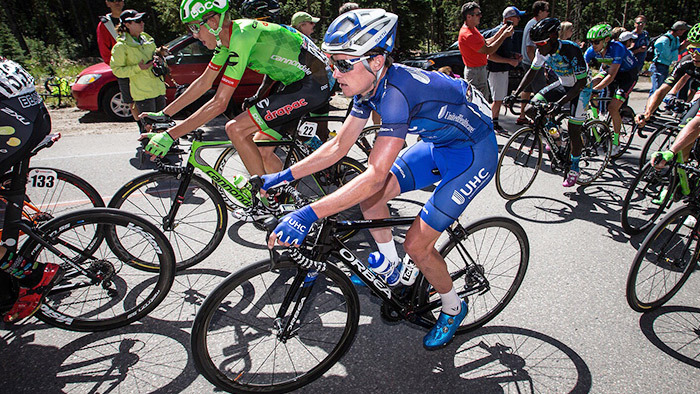 He was recently 2nd Overall at the Larry H. MIller Tour of Utah and is leading the national PRT race series. To keep up with Gavin on the road follow him on Twitter @gavinmannion and Instagram @gogo.gavin.